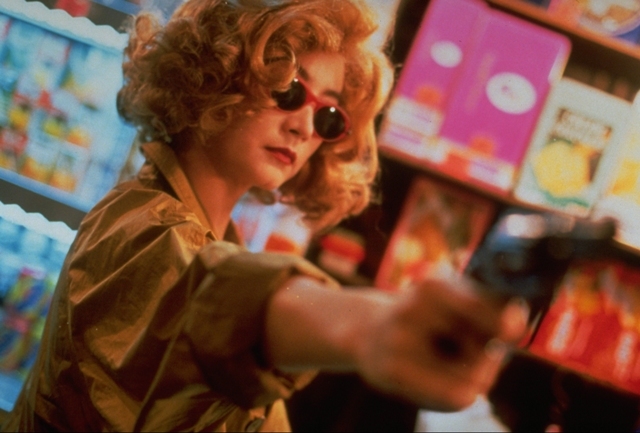 Wong Kar-wai is a Hong Kong filmaker whose movies are visually sumptuous and often highly stylised. He makes films in all genres from love stories to science fiction and crime melodramas to martial arts pictures. His characters are often in search of romantic love in the midst of their brief lives. Their stories are punctuated by intensely vivid scenes with colour in particular being exaggerated to great effect. In The Mood For Love, which he made in 2000, is perhaps his most successful and best known movie in the west - telling a 'Brief Encounter' type love story with beautiful costumes and long slow tracking shots to create a dreamlike tableau. Chungking Express is shot by his regular cinematographer Christopher Doyle - an Australian based in Hong Kong - who has been awarded numerous times for his brilliant work including the technical prize from Cannes. Chungking Express tells two separate stories set in Hong Kong - each featuring a policeman and his romantic attachments. A handsome and gifted cast play out their roles amidst the tenement blocks and food stalls of this bustling city, but their characters are more truly living inside their own interior worlds. March 20, 2013 by Lucas Jones.